William Ishmael (Billy) Thomas was born to William and Catherine Thomas in 1874. He was the first male child of European ancestry born in the Chemainus Valley, and lived here for all of his 102 years. Following his father’s death in about 1878, his mother remarried William Alexander Miller. The log cabin fronting the Chemainus River, which had served as their home, was eventually replaced by a larger farmhouse. It was the house Billy would live in all his life. 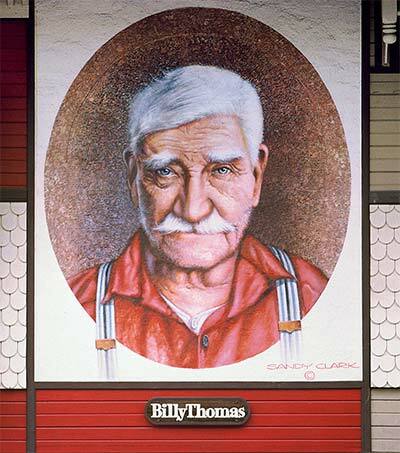 Although he surveyed for a time, Billy mostly earned his living from his 300 acres of land. He sold wood, some to help build the Chemainus River bridge, on which he worked. Some of the wood went to the sawmill, and some went to private customers. He and his sister raised cows, and sold milk and cream locally. Billy also raised heavy horses – Clydesdales. At the point where he could have made a little money from the sale of the horses, trains and trucks took over the transportation business. Billy could recall many things in his later years. He remembered the building of the railway and the rerouting of the first highway because the oxen got stuck in the mud near the river. He had vivid memories of all the payrolls that had ever been stolen from a train or coach. He recalled the long day’s ride to Nanaimo for supplies, and he even remembered the days when supplies came by boat. 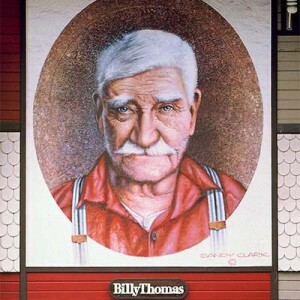 Billy Thomas is fondly remembered by many valley residents, and they think he would have been very pleased to know his image is part of the mural project of Chemainus.